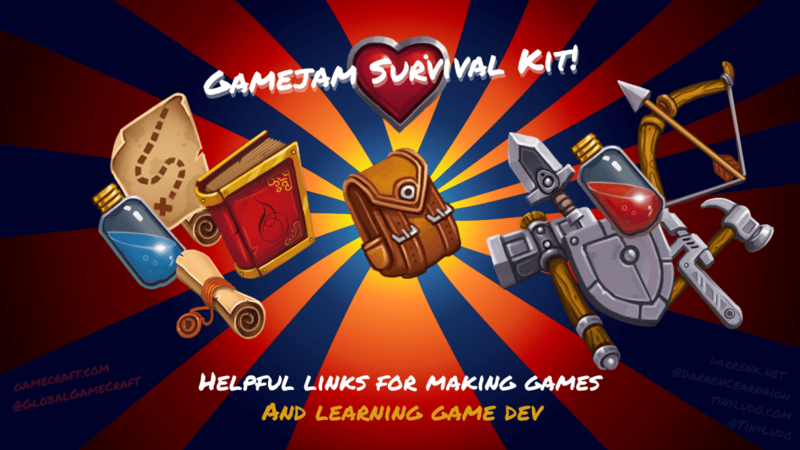 This list of resources is a treasure map of links to help you prepare for participating in gamejams ahead of time as well as get you up and running as quickly as possible. Primarily listing links to curated lists of learning resources, as well as resources which many game makers have found useful. Getting started is very daunting in any creative endeavour. Games, being both very technical and creative, can be even more terrifying for beginners to consider starting. So far in my blog, I’ve mostly written sprawling heaps of words on my own gamejam experience, expounding the benefits of gamejams and my own takeaways. But that is of little use to people in a gamejam. What would be useful? Links. Links to practical, useful resources. Resource lists are nothing new, and there are some awesome lists out there that can really get you into some deep learning. It hadn’t entered my mind to make one here until @whykay of Global Gamecraft mentioned it to me at the recent Cork Gamecraft. It was a good idea, so I set about making one. If you have links you would like to add to this article please let me know in the comments.